This raffle is closed. Congratulations to Philip H. for being selected the lucky winner. Many thanks to all who participated! Here’s a chance for you for some chocolate from L. A. Burdick! Take a sheet of origami paper that is colored differently on its two sides. If you make a valley fold along a vertical crease one-third of the way into the paper as shown above, you will end up with a model that shows exactly half of one color and half of the other color. To locate the crease that is one-third of the way over, one can use a technique widely known to origami folders. First, one makes a crease along a diagonal. Then one pinches the halfway point along an edge. 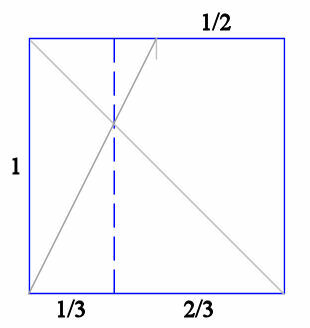 Next, make the crease that runs from the pinch over the diagonal and to a corner (as shown in the figure). This crease will intersect the diagonal at a point one-third of the way across. We ask for a single fold made over a crease that runs parallel to a diagonal that produces a model showing equal amounts of both colors. We also need a folding sequence to achieve this fold (so you don’t have to do any measuring with a ruler, for instance). Send your folding sequence to us at: girlsanglepuzzler “at” gmail.com. Include your contact information in the body of the message. We will have two random drawings at midnight on September 25, 2012. One will be for student entries and the other for all entries received. So, if you are a K-12 student, you may optionally indicate this by putting “K12” somewhere in your message. The lucky “winners” will be sent some nice chocolate from L. A. Burdick. This entry was posted in Uncategorized and tagged geometry, origami, raffle contest. Bookmark the permalink.